This week, our challenge was to "make it move." I toyed with several types of cards but what I really wanted to do was something I hadn't made in a while. 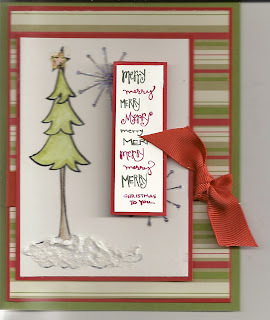 So, here is my Christmas-themed "Make-it-Move" card. "What?" You say? "Christmas? Uh, that is kind of a floral card." Well so it is! I hadn't made these flip-tag cards (from the August 2006 version of the Technique Junkie Newsletter) for ages, so before I made my "final" card, I decided to practice. 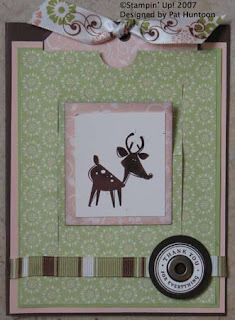 I dutifully pulled out scraps to make a card and grabbed the deer set to go with it. Well, after playing with it for a while (and kept adding and adding and adding), I decided that I really LIKED this practice card and that this was going to be my final version. So that is why my Christmas themed card is not Christmas themed! The card at the top is when the tag is pulled, and at the right is the card closed. Okay, so here is the confession part. This card is one big advantageous serendipity (also called a happy accident). I had stamped the "such a deer" saying on the green layer, under the top layer, but guess what? It was crooked (very very crooked!). 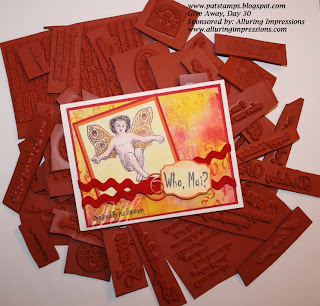 What is a stamper to do? I put a layer of paper over that. But shoot! The dang thing was too thick for the tag to close smoothly. So rip off that puppy! And, of course, the paper came with it. So what is a stamper to do? I pulled out a punch...punched the offending part right off, and stamped the saying again and the flowers with a stamp positioner this time (it takes me a while, but I do learn from my mistakes). But shoot! The saying was too close to the bottom of the punched area. It looked off-balance. So what is a stamper to do? I added the ribbon! The ribbon is attached to the top layer only on the sides so that the top can close. But shoot! That top layer looked strange just hanging out there! So let's put something on top of that! The circle stamp was just the thing. And that is how my stamping goes...one advantageous serendipity after another. So there you have it. My confession. I am the most imperfect stamper out there! I just stamp from one happy accident to another. In any case, enjoy my Christmas themed move-it card. I may be way behind, but I am catching up (although I do have to go to the Post office today -- if you don't hear from me by Friday, send a rescue team)! Today I scanned ALL of the RAK and other cards that I have in my house. I really love these cards and wanto to share them with you! I created this slideshow of the cards I scanned --each person's name is on the card. I also updated my own slideshow a bit -- it is at the end of all the posts. If you want to know when I update that slideshow, there is a bar at the top of the slideshoe "MORE" where you can sign up and you will be notified automatically when I make changes to the slideshow of my work. 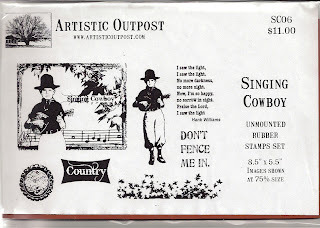 The winner of the first Artistic Outpost Blogger Give away is Joyce Roth! Congrats, Joyce! Another give away will be posted shortly! 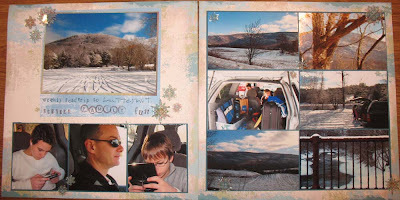 This week's Blogger's Challenge was to create a Sympathy Card. This was a easy- and a hard - challenge. I believe that sympathy cards should be simple, elegant, and not overworked. 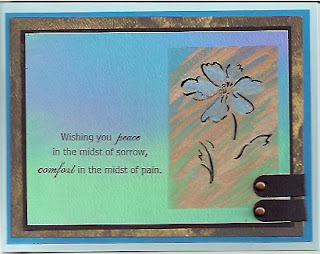 Sympathy cards, more than any other cards, are defined by what is INSIDE -- not what is outside. So my way of making sympathy cards is to create something soothing and elegant. 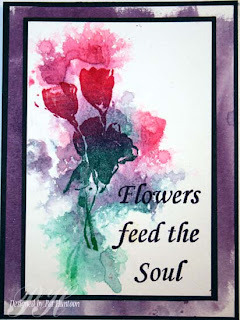 When my Mom passed a few years ago, I received hundreds of cards -- and although I was never able to scan and post them (they evoked too much emotion), I did look at them often and gained much comfort from the love and support they represented. Needless to say, I don't take sympathy cards lightly. 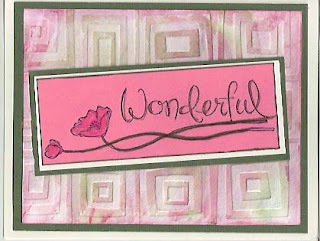 Hopefully today I have captured the soothing elegance I was striving for, The flower (from Stampin' Up!) 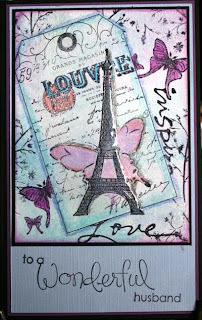 on my card was stamped on acetate with a StazOn pad, then it was colored with Lumiere paint that was tinted with a smidge of Pearl Ex. I chose colors that matched the blue and green background -- which was made using the Watered Tintz technique from the December 2006 issue of the Technique Junkie Newsletter. This was layered on a thin edge of black, then layered again on a Metallic Explosion background (done on matte paper, to bring down the bling) from the August 2006 issue of the TJNL. This was then mounted on Turquoise, then on a very pale blue. 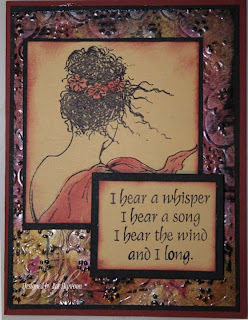 The verse is from Firecracker Designs by Pamela (the sympathy stamp set from this company is wonderful, and VERY affordable). Hopefully I won't need to send this card out anytime soon. 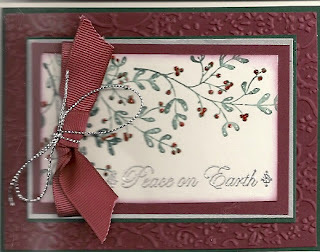 I am STILL working on Christmas cards -- or at least I was until a few hours ago! As of last weekend, I had made 55 -- I thought I had more than enough. Then I started to address the envelopes... I realized that I missed quite a few people, then the mail came all week and I realized I missed more than I thought! The final total is around 75 - so to the studio I went, determined to finally finish the adventure. And finish I did! I made two more cards, 12 of each, to top off the stash of cards. If more names come up, I will have to scrounge up some others from my swap and premade boxes...I am done making Christmas Cards! Here is the first card I made today. 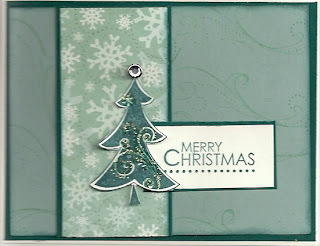 It used the tree, star and snowflake from Hanna Stamps. 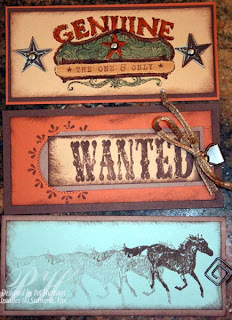 I love the playful whimsy of these stamps, don't you? I paired these with a vertical verse stamp I bought yesterday for $1.00 (Studio G) when I bought my $45.00 Brilliance Pad (that story is below). The tree was colored using the Gamsol Pearls technique from the June 2006 issue of the Technique Junkie Newsletter. The snow is texture paste with a dash of glitter, and the snowflakes behind the verse are glittered, too. 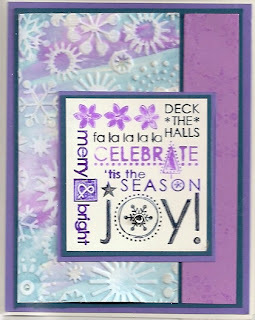 The designer paper and the ribbon is from Stampin' Up! Want to hear something funny? My DH really loves this card. It's funny because this is the paper that he HATES -- he doesn't like the color combination. Hmmm...he never noticed that it is the same designer paper! The second card didn't scan well -- put it is very cheery! 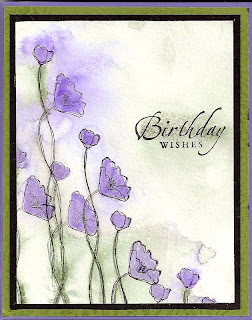 This 4" x 8" card is on shimmery card stock (the blue, purple and white are all shimmery). The snowmen stamp is from Stamps Happen (they were also found in my bag during the $45.00 Brilliance pad shopping trip). The fun shimmer behind the snowmen is the Oh-So-Fru-Fru technique from the August 2007 issue of the Technique Junkie Newsletter. 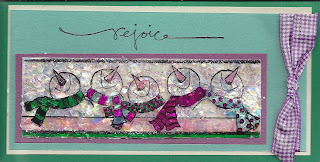 "Rejoice" is a retired Stampin' Up! stamp. Okay, so why did I buy a $45.00 Brilliance Pad? Well, I didn't, exactly : ) One of the TJ subscribers submitted a technique to me for consideration and I was trying it out on Monday. The recipe called for a Gold Brilliance Pad. My pad was REALLY dry, so I put it aside and tried the technique with a Copper Brilliance pad. The copper worked okay, but I could tell that the Technique would just POP with a gold pad. So Tuesday, I went to Michael's to get a re-inker or a pad. I have a bad history there...I always spend more than I intend. Luckily I don't ever have much time to shop! To combat the spending issue, I decided to go to Michael's between other things I had to do on Tuesday, leaving myself a short window of time so that I couldn't browse too much... I mean, we are talking SHORT. I had about 10 minutes in the store to get what I needed and check out. Well...the Brilliance Pad cost me $45.00. Dang, man, I just can't help myself! Lotsa dollar stamps, some storage (I am always running out of storage space, I wonder why??? ), and, of course, the accursed Brilliance Pad. All in 10 minutes. Holy cow, it is a good thing I didn't have more time!!! At least, I am certain that I am in good company -- chances are this happens to YOU too! The technique was worth it, though...and I was right, gold was better than copper! How about a Give-away? I miss them! Okay, I admit it. I miss the giveaways. The excitement. The thrill of reading your blog messages. Making the cards everyday (okay, so maybe that was hard LOL). So, I have an idea... Let's do it again! This time around, you have three days to enter -- from now until Friday at midnight -- and then on Saturday I will announce the winner and post a new Giveaway. Sound like fun? Let's kick it off! I would like to introduce to you a fairly new stamping company called Artistic Outpost. Started by long-time Technique Junkie Robyn Sharp, these stamps are artistic, fresh and cool! They are just the type I love. I was lucky enough to receive some stamps from Robyn -- some for me and some for you! So let's get down to it. 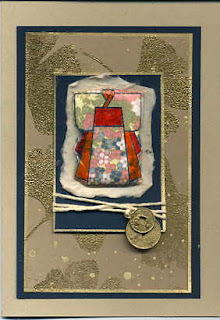 First, the card I made from today's stamp set uses the Faux Denim technique from the December 2007 issue of the Technique Junkie Newsletter. I just love this little cowboy! 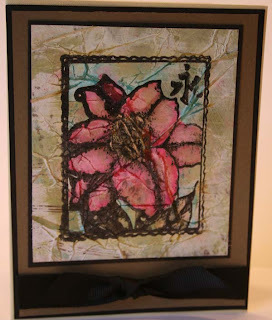 For today's giveaway, you will receive the gorgeous unmounted stamp set above, plus the card above. 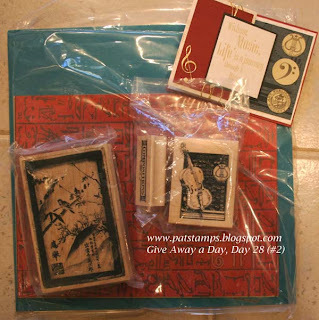 The stamps are deeply etched and gorgeous -- all of Artistic Outpost's stamps are! Go take a look at the site when you are done entering the giveaway -- I am sure you can find something for your own Christmas list! Entry details are below. Tell Robyn I said "HI!" ANYONE can enter. One entry per person, per daily give away please. To enter the give away for today, simply leave a comment on this blog entry telling me that you would like to enter by 11:59pm EST on Friday December 14th. No other entry methods will be included in the give away. If you email me to enter, your entry will NOT be considered a valid entry. When you leave the comment, make sure to put your NAME in the comment -- if you enter your comment as "Anonymous", I cannot give you the prize! Blogger does NOT record your email address for me, so you will need to check back to find out if you have won or include your email address in your comment so that I can notify you. I will have a random number generator pick one number from the comments to select one winner. Each give-away is separate, so to be eligible for a specific item you must enter that day's contest on the post where it is listed. Enter today -- good luck! Congratulations to Joyce Roth, the winner of the stamps and card! Welcome to Friday! It's Blogger's Challenge day and it feels great to be back in the swing of things. Today's challenge was to Watercolor....and watercolor I did! The crab was stamped, then masked, and the hat was stamped over it. Both were watercolored with Watercolor Pencils AND Watercolor Crayons, then layered on a red Nestibility scalloped square. I added a bit of liquid applique` to the hat and a bit of Crystal effects to the eyes to add interest. I inked 1/2 of the Mesh Cuttlebug Embossing Folder with Cocoa ink (the bottom half, so the bumps were colored). I placed the paper face-down in the bug and only put 1/2 of the cardstock through the Bug. (This is an easy version of the Cuttlebug Smoosh Technique from the August 2007 Technique Junkie Newsletter). Then I added red and brown watercolor crayon colors with my aqua painter to get the multi-colored background under the bumps. Dry with a heat tool, and Viola` - instant interesting background! 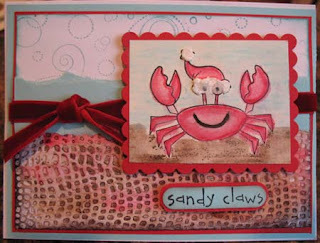 To finish, I inked the edges of the white piece, added the torn Cool Carribean strip, added a velvet ribbon and layered the background on red and Caribbean paper before popping the crab piece with pop dots. I hope you like it as much as I do!!! I may make more of these to add to my Christmas Card stash -- my DH keeps adding names to the list! I also make 4 or so different cards -- some whimsical, some non-denominational, and some elegant (usually because I get bored making too many of one card!). My DH addresses the envelopes and fills out the inside sentiments, thankfully, so it is up to him to determine who gets which card. Oh, did I mention that my husband is a Creative Director with 20 artists who work for him that we send cards to? No pressure there, right? This year I am a little behind the 8-ball. I have designed several cards, and I think I am happy with two or three of them. This one I know I am using (please ignore the "scanner blur" on the left of the piece): This card was basically inspired from a card from Karen Cielen. Her's is prettier than mine! I changed the colors, some of the stamps, and simplified my version a bit. This card is very elegant in real life. The red berries are glitter -- I just love the way it looks. It is just too Blah, don't you think? ...and this one -- My DH likes this for our whimsy card. It was inspired by something my friend Dee Ruger made (hi Dee!). I like it because I can whip these out! I have to re-work the ribbons a bit, but you get the idea. It is sparkly IRL. 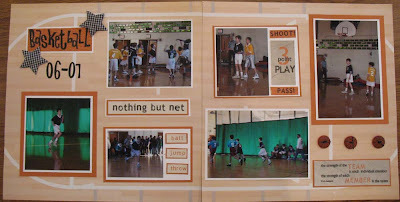 Then there is this one: This was done using the Dry Embossed Wash Technique from the December '07 TJNL. I love this technique and I really like this card -- I am still pondering this one to make it even better. I really like this one, too. It is done using the Technicolor Dye Ink Technique from the Newsletter -- I think the bling is the perfect balance with the soft background and the strong snowflakes. 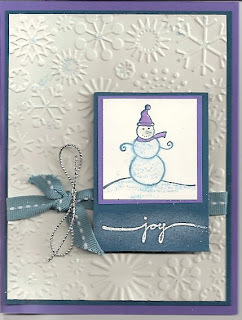 (Did I mention that I LOVE snowflake stamps? I have tons of them!). DH just simply hates the colors. He asked me to change out the green...uh, that would be a little tough since it is designer paper!!!! (I thought it was too simple anyway). Okay, now you see my quandary this year. Only one card I really really love (okay, too -- I like the Noel card, too). I need help! Anyone have any sensational cards I can CASE? Please? I'm sorry for the crooked picture! It looks a bit skewed...but I think you probably get the right idea. 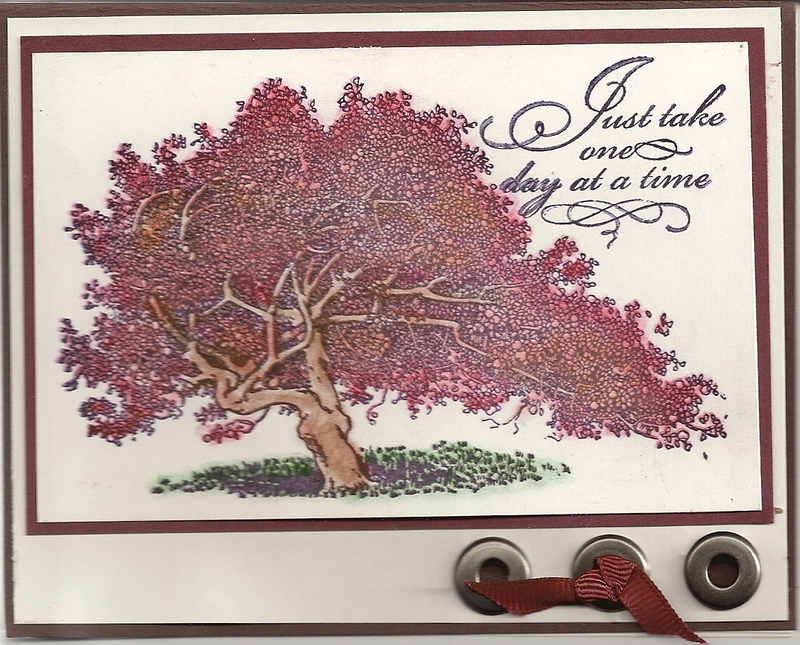 Fall is one of my favorite seasons -- at least it is in the top four ; ) This stamp by I Brake for Stamps was just made for fall colors, and since I didn't stamp much in November, I am catching up! 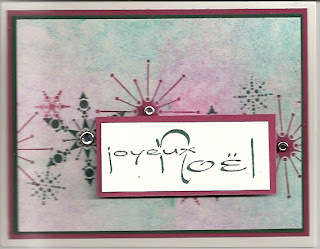 The technique used on this card is Pastel Detailing from the December issue of the Technique Junkie Newsletter. Although the technique works best on highly detailed stamps, I love the way the color was so easy to apply using the technique. I really like the subtle shading! 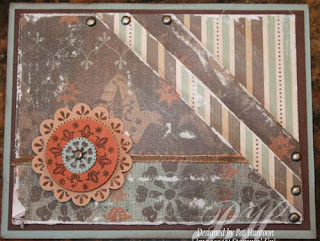 This was the first time I tried the jumbo eyelets from Stampin' Up!, too. I still don't have the settings down for setting them with my Crop-a-Dile, and really struggled putting them in. I need to play with these more! Next week I get to create! Now that the December issue is mailed, I have two more techniques to put to pictures for the February newsletter -- then I can go into "sample-making-frenzy" mode. I love the first week after the newsletter is mailed more than any other week! I usually start with a few techniques in my file to put into tutorials, then I just start to play -- putting together different ideas I have floating in my head....trying out one thing with another...and new techniques are born. As I am creating, I pump out tons of backgrounds and unfinished pieces all at once, then make 25 to 50 cards or so over the course of the week to create samples. The hardest part of all this is not being able to scan and share them with anyone else! Looking for a gift for under $20.00? 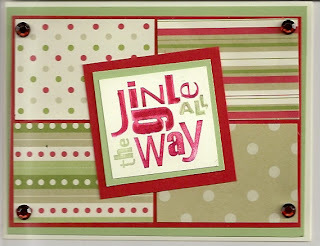 For just $19.95 you can order the Technique Junkie Newsletter for yourself or another stamper on your Christmas List. You will receive 7 issues – from December 2007 through December 2008 – a total of 85 or more techniques – for under $20.00! One password for the next 7 issues – easy online access plus newsletters delivered to your doorstep through the end of next year! To order, email phuntoon@optonline.net for an invoice through PayPal, or send a check to Pat Huntoon, PO Box 16547, Stamford CT 06905. Offer expires January 15, 2008. Offer valid on subscriptions to US addresses only. Where else can you get a year’s worth of presents for under $20.00?? 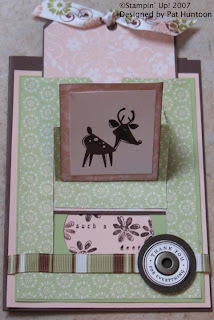 This week's blogger's challenge was to create at least two items using the same stamp in a different way. Of course, I attacked this with gusto! I marched into the stamping oasis and pulled out a stamp willy-nilly -- I thought "This is EASY! Any stamp will do!" So what do you think happened? I was, of course, hit by the old stamper's block -- nothing would come of it. I did create the two cards here, but I am not thrilled. I may give this a go again later this week. I love this stamp, and I know there is tons that I can do with it...oh well. So here is the first shot at the stamp: The stamp that we are focusing on is the flower stamp. 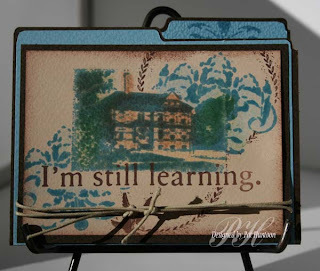 It is one of a few stamps from a hostess set from Stampin' Up! called "Oh So Lovely". I do love the lovely simplicity of it! 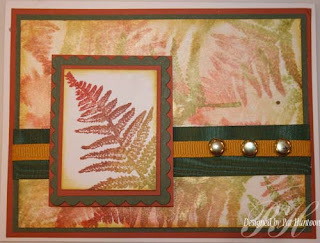 The background I used here is one from the newest Technique Junkie Newsletter called Dry Embossed Wash. I LOVE this background -- it is so soft and pretty in person. Okay, here is attempt number two: This one uses the Marker Wash Technique from the October 2007 issue of the newsletter. I still love this technique -- I think the faux watercolored look is just divine! The layout of both of these are very simple -- I just couldn't drag out the embellies -- my mojo is still in Paris, I think! In any case, the newsletter was mailed on Thursday (11-29, yesterday) -- all of you junkies can go take a look at the site -- and watch your mailboxes : ) Drop me a line and let me know which of the new techniques are your favorite! I am scrapbooking today -- I am taking the day off after I get through my hundreds of emails and I hope that will jumpstart my creative muse! I will share if I do anything of interest. First, my apologies. I went from a Blogging frenzy in October to dead air in November! Although November seems to have blown by me, it has been wonderful. My oldest son made his Confirmation, I had company for a week (my shopping sister), and best of all, my DH took me to Paris for our 20th wedding anniversary! I am sure that you will indulge me and excuse my absence...I promise to make it up to you! I won't let my life get in the way again : ) Well, maybe I shouldn't promise that! Okay, the last Blogger's challenge I missed was an inspiration challenge. The idea was to base our work on something around us that has inspired us recently. Well, who wouldn't be inspired by my subject matter? 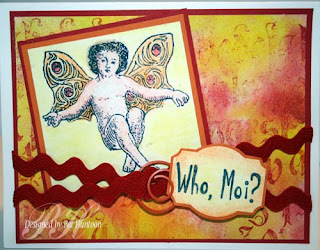 I made this card for my DH using a technique from the upcoming Technique Junkie Newsletter -- Technicolor Dye Inks -- for the background. 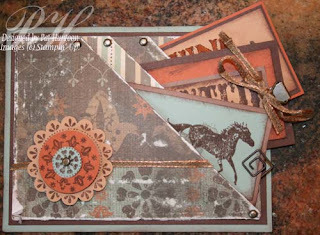 The collage over it uses a ton of stamps -- Stamper's Anonymous, Stampland, Club Scrap, VAP Scraps and Stampin' Up! I hope he likes the card! I will post more tomorrow (may later tonight, too) about my trip...but in the meantime, rest assured that I will be back in the stamping saddle for the remainder of this month! I will be posting teasers all week. I mail the December issue of the Newsletter on Thursday, so it's not too long to wait for the link to show up, right? HEEELLLLLO Hanna! 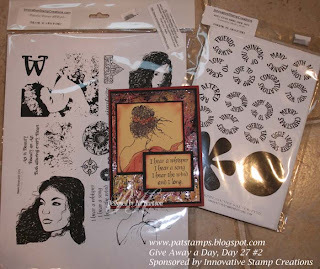 My online friend Kristi Ferro recently started her own stamp line called Hanna Stamps -- and the first set she has to offer are these wonderful stamps called "But I Need It..." I think there is a very big difference in the quality of acrylic stamps -- and Hanna Stamps are QUALITY. Don't you just love the style of these stamps? I knew I needed to use them for this Blogger's Challenge as soon as they arrived in my mailbox. 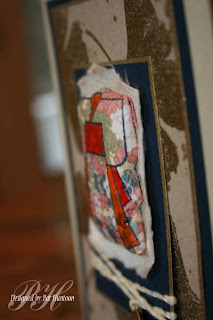 This week's blogger's challenge was to use an embellishment. Any embellishment. I WAS going to use a silk flower that I died to match my paper --- but then I found this great paper from 3 Bugs in a Rug WITH the flower on it in my stash and I knew what I needed to do! I cut around the edges of the flower -- the flower and the striped paper are one piece. I attached the edges of the flower to add dimension, and popped the button in the middle to add to my paper embellishment. Hanna was colored with Watercolor Crayons. This is a 5" x 7" card. I am so psyched about these stamps and about this card! My sister is coming to visit next week for my son's confirmation, and one of the things we are doing together is to SHOP! I never make time to shop for myself -- so she and I are going on an expedition to pump up my wardrobe (my biggest fear is that someone will call "What Not To Wear" on me!). 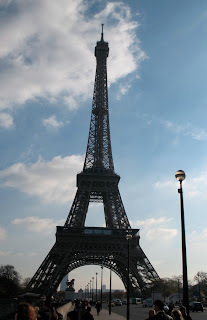 Since I am going to PARIS later this month, I need new clothes! These stamps came in the nick of time -- I made this cards for my sister to welcome her to my home and to let her know how excited I am that she will be here with me. She and I are VERY compatible shoppers! She will tell me the truth about how things look, yet still allow me to buy things that I love without saying "Do you really need that?".... She truly understands the phrase "But I need it!..." Today is Day 31 of the Technique Junkie Newsletter 5th year anniversary Celebration, and there will only be one winner today for the Grand Prize. Please show your appreciation to these fine vendors for their generosity by making them your first choice for your stamping supply needs. The winner of this Give Away will be a Technique Junkie for Life. Every back issue and every CD I have ever published will be sent to the winner. In addition, the winner will receive all future issues, all future CDs, all future publications from Technique Junkies and/or patstamps.com. They will be a Technique Junkie for Life. ANYONE can enter. One entry per person, per daily give away please. To enter the give away for today, simply leave a comment on this blog entry telling me that you would like to enter by 11:59pm EST on Thursday, November 1st. No other entry methods will be included in the give away. If you email me to enter, your entry will NOT be considered a valid entry. When you leave the comment, make sure to put your NAME in the comment -- if you enter your comment as "Anonymous", I cannot give you the prize! Blogger does NOT record your email address for me, so you will need to check back to find out if you have won or include your email address in your comment so that I can notify you. I will have a random number generator pick a number from the comments to select the winner. Good luck! Congratulations to Sheryl Dickinson, who is now a Techique Junkie for LIFE! Day THIRTY of the Technique Junkie Newsletter Give Away a Day -- and again we have two great items to give away. Thank you to those of you who have been following the Give Away this month to celebrate the Technique Junkie Anniversary. Yesterday I asked junkies to talk about what they liked best...thank you all for your kind words! 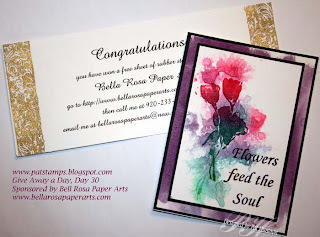 Our first give away is from Bella Rosa Paper Arts. The lucky winner of this part of the Give Away will have their choice of ONE stamp sheet from the Bella Rosa Paper Arts website. I love the beautiful images on the Bella Rosa site -- you will too! In addition to being able to pick a stamp sheet, you will receive the card on the left. 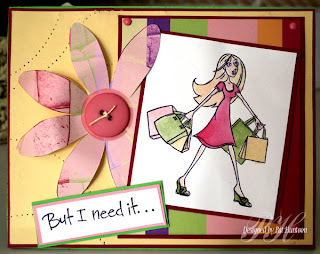 This card was made using Bella Rosa Paper Arts stamps, of course. You may not remember, but the last time Bella Rosa sponsored the give away, I mentioned that I was clicking right over to get the floral sheet just released by Linda on her site -- and I wasn't kidding! I saw these stamps and all I could imagine was the Expressionist Watercolor Technique (from the December 2004 issue of the TJNL). Well, I did buy it and made this card. I was right - the stamps are perfect for the technique! The background is made with the Watered Tintz Technique from the December 2006 issue of the Newsletter. Our next give away is sponsored by one of our most generous sponsors, Alluring Impressions. I know you ladies love these piles o'rubba! There is nothing like a pile of unmounted stamps -- and one lucky winner will receive this pile of beautiful, deeply-etched stamps from our wonderful sponsor Alluring Impressions. The card candy for the Alluring Impressions winner is this Cottoned Color (April 2007 issue) angel card made with Alluring Impressions stamps. The angel was colored with Gamsol Pearls from the June 2006 issue of the Newsletter. Here is how you can win one of these two give aways...Remember, there will be two winners chosen from the entries - one for each prize. Good luck! ANYONE can enter. One entry per person, per daily give away please. To enter the give away for today, simply leave a comment on this blog entry telling me that you would like to enter by 11:59pm EST on Wednesday, October 31th. No other entry methods will be included in the give away. If you email me to enter, your entry will NOT be considered a valid entry. When you leave the comment, make sure to put your NAME in the comment -- if you enter your comment as "Anonymous", I cannot give you the prize! Blogger does NOT record your email address for me, so you will need to check back to find out if you have won or include your email address in your comment so that I can notify you. I will have a random number generator pick two numbers from the comments to select two winners. Each give-away is separate, so to be eligible for a specific item you must enter that day's contest on the post where it is listed.Check back every day during the month of October for the daily giveaway -- you can enter EVERY day! A fabulous Grand Prize will be offered on the last day of the month, too. Enter today -- good luck! Congratulations to Crystal French, the winner of the Bella Rosa Stamp Sheet Choice, and to Holly Young, the winner of the Alluring Impressions Stamps! Again we will have two more items to give away to celebrate the Technique Junkie Newsletter's 5th anniversary! Happiest of anniversaries, Junkies! Five years, 400 techniques. By far, the MOST extensive one-source library of step-by-step tutorials that exists anywhere. If you are a visitor and you have not subscribed, what are you waiting for? Let me give you a little incentive: New subscribers, if you subscribe to the issues from 10-07 through 12-08, I will send you the 10-07 issue Free. Free. That is a $3.00 savings! So, $21.00 for the issues from 10-07 through 12-08. Hurry, though, I am only offering this until Friday, November 2nd! There will NOT be any extensions on this deadline. US addresses only. Email me for an invoice if you are interested. Subscribers, why don't you tell us in your comments why you love being a Technique Junkie? If each of you tells one other person today about the newsletter (and the special), that would be the best anniversary present you can give me. Okay, thank you for allowing me to put a "commercial" up -- I figure with all these give aways, I am allowed a commercial : ) On with the give aways for today! Our first give away is from one of the most generous sponsors of this Month's anniversary celebration -- I Brake for Stamps. I don't know about you, but this company has become one of my favorites! One lucky winner of the Give Aways will receive these two stamp sheets, and the card shown here. I Brake for Stamps has donated more than their share of Give Aways for us -- why don't you go over to Della's website and show your appreciation? The eye-candy that goes with this Give Away uses I Brake for Stamps with the Scrunchie Technique from the October 2007 issue of the Newsletter. I stamped directly on the background and colored the image with markers, then removed some of the color with a blender pen. I like the effect- very "copic-esque." 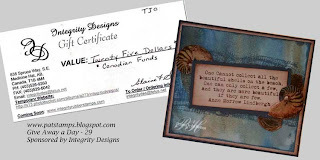 Our next Give Away is another fabulous gift certificate from our friend Elaine at Integrity Designs. The lucky winner of this part of the Give Away will receive a $25.00 (Canadian) gift certificate to go shopping on the Integrity Designs website! With the favorable exchange rate, that is one great Give Away! 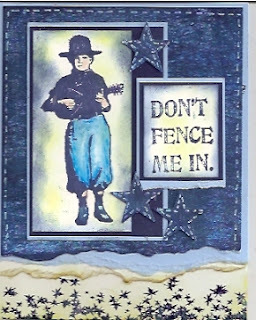 Integrity Designs carries many of my favorite Stamp lines -- Innovative Stamp Creations, Time to Stamp, Non-Sequitur Stamps, Starving Artistamps, and many many more. Thank you, Elaine, for this generous Give Away! Have fun shopping, ladies. 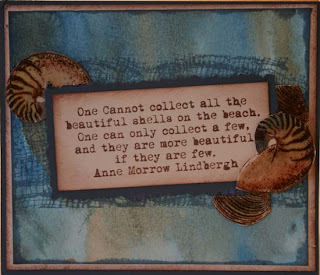 The eye candy that goes along with this card was made using Time to Stamp images from the Beach Memoirs sheet. The background is the Watered Tintz technique from the December 2006 issue of the TJ Newsletter. The shells were colored with pastels and then covered with diamond glaze (CE) to add dimension. This card will be sent to the gift certificate winner. Remember, there will be two winners chosen from the entries - one for each prize. Good luck! ANYONE can enter. One entry per person, per daily give away please. To enter the give away for today, simply leave a comment on this blog entry telling me that you would like to enter by 11:59pm EST on Tuesday, October 30th. No other entry methods will be included in the give away. If you email me to enter, your entry will NOT be considered a valid entry. When you leave the comment, make sure to put your NAME in the comment -- if you enter your comment as "Anonymous", I cannot give you the prize! Blogger does NOT record your email address for me, so you will need to check back to find out if you have won or include your email address in your comment so that I can notify you. I will have a random number generator pick two numbers from the comments to select two winners. Each give-away is separate, so to be eligible for a specific item you must enter that day's contest on the post where it is listed.Check back every day during the month of October for the daily giveaway -- you can enter EVERY day! A fabulous Grand Prize will be offered on the last day of the month, too. Enter today -- good luck! Today's winners are: Kat Merryman, who has won the I brake for Stamps Sheets, and Debbie Ebat, who has won the Gift Certificate from Integrity Designs. Congratulations, ladies! Penny Wise Arts is back! 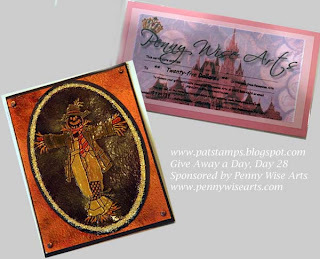 As one of our most generous sponsors for this give away month, I am proud to once again be able to offer a $25.00 gift certificate for the Penny Wise Arts website. Ladies, run over there and fill your shopping cards! You can bead EVERYTHING! The winner of this gift certificate from Penny Wise Arts will certainly help "Bead the World". Along with the gift certificate from PWA, the first give away winner will also receive the card on the left. 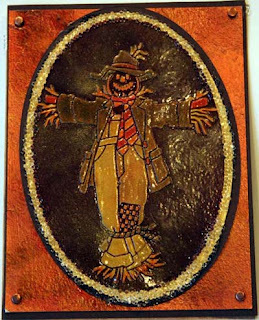 The scarecrow image was created using the Stencils and Marker technique, a bonus technique on the 4th Edition CD. The background is the Textured Metallic Technique from the April 2006 Issue of the Newsletter. the main image is outlined by clear Penny Wise Arts beads. 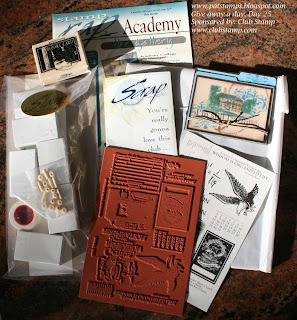 The Second Give Away for today, above, is a package of stamps and paper from Club Scrap. The two stamps shown above are retired...and in demand! There is also a generous pack of assorted papers for you to use on your stamping and scrapbooking projects. Along with the stamps and the paper pack, you will receive the Z-Fold card shown above. The Z-Fold Card was the online bonus technique from the 8-07 issue of the Technique Junkie Newsletter. Remember, there will be two winners chosen from the entries - one for each prize. Good luck! ANYONE can enter. One entry per person, per daily give away please. To enter the give away for today, simply leave a comment on this blog entry telling me that you would like to enter by 11:59pm EST on Monday, October 29th. No other entry methods will be included in the give away. If you email me to enter, your entry will NOT be considered a valid entry. When you leave the comment, make sure to put your NAME in the comment -- if you enter your comment as "Anonymous", I cannot give you the prize! Blogger does NOT record your email address for me, so you will need to check back to find out if you have won or include your email address in your comment so that I can notify you. I will have a random number generator pick two numbers from the comments to select two winners. Each give-away is separate, so to be eligible for a specific item you must enter that day's contest on the post where it is listed.Check back every day during the month of October for the daily giveaway -- you can enter EVERY day! A fabulous Grand Prize will be offered on the last day of the month, too. Enter today -- good luck! The winners of this Give Away are: Lori Puccio and Barb Wessel! Congratulaions, ladies! Give Away a Day - Day 27 - Two winners! Today we have another double-header! There are two give aways today again, so you have two chances to win once again. Good luck! Our second sponsor for today is Innovative Stamp Creations. These two beautiful stamp sheets and the Cuttlebug Glow card will be sent to the second winner. If you haven't been to the Innovative Stamp Creations Website yet, what are you waiting for? So many elegant, beautiful images to choose from. While you are waiting for this Give Away and the results, why don't you take a look the the Innovative Stamp Creations website? The eye candy that comes with the ISC stamp sheets is made using the Cuttlebug Glow technique from the October Issue of the Technique Junkie Newsletter. It is impossible to see the beauty of this card online -- but it is stunning in person -- even more so with the beautiful Innovative Stamp Creations images. Remember, there will be two winners chosen from the entries - one for each prize. Good luck! ANYONE can enter. One entry per person, per daily give away please. To enter the give away for today, simply leave a comment on this blog entry telling me that you would like to enter by 11:59pm EST on Sunday, October 28th. No other entry methods will be included in the give away. If you email me to enter, your entry will NOT be considered a valid entry. When you leave the comment, make sure to put your NAME in the comment -- if you enter your comment as "Anonymous", I cannot give you the prize! Blogger does NOT record your email address for me, so you will need to check back to find out if you have won or include your email address in your comment so that I can notify you. I will have a random number generator pick two numbers from the comments to select two winners. Each give-away is separate, so to be eligible for a specific item you must enter that day's contest on the post where it is listed.Check back every day during the month of October for the daily giveaway -- you can enter EVERY day! A fabulous Grand Prize will be offered on the last day of the month, too. Enter today -- good luck! 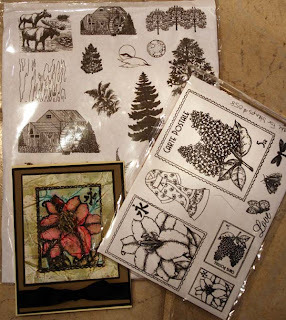 Congratulations to Wendy Little, the winner of the Elusive Stamp Images from The Lilac Tree, and Cindy Hargett, the winner of the stamp sheets from Innovative Stamp Creations! We are closing in on the end of the month, and as we do, I am a little sad to see the give aways go away! Thank you to so many of you who have helped me celebrate the Technique Junkie Newsletter's 5th Anniversary so far. I hope you will stick around for the next 6 days while we wrap things up. Today, we have something VERY exciting for you! There will not be one winner today --THERE WILL BE TWO! 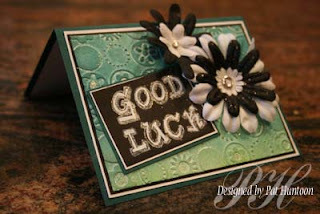 Today's give away sponsor is Stamp Attack UK -- they are the maker of the stamps used on the two cards shown in this blog entry. Stamp Attack UK has the most gorgeous stamps -- and the two winners will be able to pick out one plate apiece from the site as their prize! Why don't you go ahead a take a look at what Stamp Attack UK has to offer and figure out which plate you would pick if you win! For this give away, I will have the trusty number generator spew out two numbers -- the first person picked will receive the card at the top of this post. This card was made using the Expressionist Pearls Technique from the 6/07 TJNL issue-- it is VERY shimmery in real life! In addition, they will have their choice of a Stamp Attack UK plate of unmounted stamps. The second number pulled will receive the card on the left (and below) which uses the Quilted Dimension technique from the Bonus Techniques on the 5th Edition Technique Junkie Newsletter CD, The Kimono is puffy and dimensional -- and has been covered with Gel pens. In addition this winner will also have their choice of one Stamp Attack plate. Now you have two chances to win! ANYONE can enter. One entry per person, per daily give away please. To enter the give away for today, simply leave a comment on this blog entry telling me that you would like to enter by 11:59pm EST on Saturday, October 27th. No other entry methods will be included in the give away. If you email me to enter, your entry will NOT be considered a valid entry. When you leave the comment, make sure to put your NAME in the comment -- if you enter your comment as "Anonymous", I cannot give you the prize! Blogger does NOT record your email address for me, so you will need to check back to find out if you have won or include your email address in your comment so that I can notify you. I will have a random number generator pick two numbers from the comments to select two winners. Each give-away is separate, so to be eligible for a specific item you must enter that day's contest on the post where it is listed.Check back every day during the month of October for the daily giveaway -- you can enter EVERY day! A fabulous Grand Prize will be offered on the last day of the month, too. Enter today -- good luck! Dimension card is Glenda LeValley. Congratulations, Ladies! 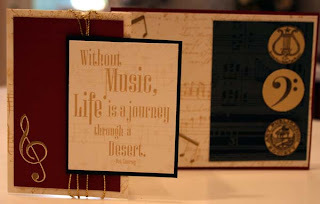 Blogger's Challenge Week 18 - Designer Paper! I love Blogger's Challenge Fridays! The challenge is always different and the creative edge is always fun to explore. See my sidebar for other players and check out their challenge cards! This week, we were challenged to use Designer Paper in our creations. I decided to take the Double Pocket fold from the TJ Newsletter and ratchet it up a notch -- I made it a Triple Pocket Fold! Thank you for looking at my BC entry for today! I do appreciate your comments, and feel free to leave them about the card -- but please, this is not a give away post and I know you all know this -- but PLEASE DO NOT POSTS GIVE AWAY ENTRIES ON THIS POST. The Give aways are above and below. Thanks! Club Stamp is a monthly kit club filled with fabulous papers, stamps and projects. Check them out today, as soon as you sign up for the give away... of course! ANYONE can enter. One entry per person, per daily give away please. To enter the give away for today, simply leave a comment on this blog entry telling me that you would like to enter by 11:59pm EST on Friday, October 26th. No other entry methods will be included in the give away. If you email me to enter, your entry will NOT be considered a valid entry. When you leave the comment, make sure to put your NAME in the comment -- if you enter your comment as "Anonymous", I cannot give you the prize! Blogger does NOT record your email address for me, so you will need to check back to find out if you have won or include your email address in your comment so that I can notify you. I will have a random number generator pick a number from the comments to select the winner. Each give-away is separate, so to be eligible for a specific item you must enter that day's contest on the post where it is listed.Check back every day during the month of October for the daily giveaway -- you can enter EVERY day! A fabulous Grand Prize will be offered on the last day of the month, too. Enter today -- good luck! The winner of the fabulous kit is Darlene LeMar! Congratulations, Darlene! Give Away a day - 24! Look at all the people who have already won! Don't you just love to shop? Today's winner will do just that with these two gift certificates from Hearts in Touch. Each certificate has a $10.00 value -- you can have a blast with these! Make sure to click on over to see what beautiful new things Hearts in Touch has to offer. Our Eye Candy today brings back a technique from the SECOND issue I published, way back in '02. 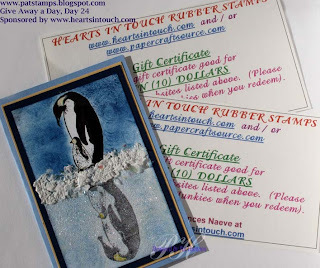 The Reflected Image technique is from the December 2002 newsletter, and just seemed perfect for these wonderful Hearts In Touch penguins. Some techniques are just classics -- this one is! 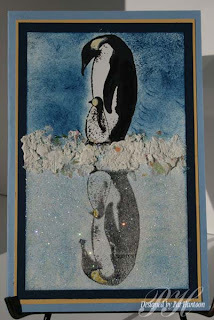 I really like the way the ice floe turned out on this card -- It is Fru Fru covered with puffy paint and it is so textural! The ice is sparkly too (as are my cheeks, my pants, the dog...) I have made so many cards this month for the give away, but this may be the hardest to part with...must make another! Of course, the card will be mailed with the gift certificates to the lucky winner of this giveaway. Here is how YOU can enter! ANYONE can enter. One entry per person, per daily give away please. To enter the give away for today, simply leave a comment on this blog entry telling me that you would like to enter by 11:59pm EST on Thursday, October 25th. No other entry methods will be included in the give away. If you email me to enter, your entry will NOT be considered a valid entry. When you leave the comment, make sure to put your NAME in the comment -- if you enter your comment as "Anonymous", I cannot give you the prize! Blogger does NOT record your email address for me, so you will need to check back to find out if you have won or include your email address in your comment so that I can notify you. I will have a random number generator pick a number from the comments to select the winner. Each give-away is separate, so to be eligible for a specific item you must enter that day's contest on the post where it is listed.Check back every day during the month of October for the daily giveaway -- you can enter EVERY day! A fabulous Grand Prize will be offered on the last day of the month, too. Enter today -- good luck! The winner of this Give Away is Alice Arteburn! Congrats, Alice!